Today, people across the world are experiencing a global crisis regarding two defining aspects that make a social system: education and surveillance. These crises not only give an insight to the patriarchal set up but also into how lack of innovative thinking, freedom of movement and scrutiny is impacting the current/upcoming generation. A two-person show titled “Bureaucracies of Imagination” was held at Canvas Gallery, Karachi on 24th April, 2018. 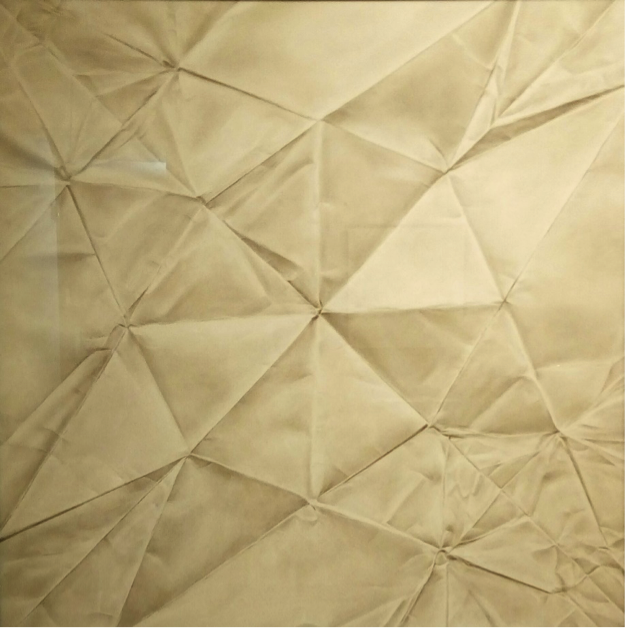 The artists, Moonis Shah and Mahbub Jokhio, who are the alumni of Beaconhouse National Univeristy (BNU), not only worked around the idea of the education system in Pakistan and public/migrant surveillance and but they also gave the viewers a futuristic insight into the two impending crises. Moonis Shah’s work discussed historical archives consisting of text, mass media and cinema which were not merely plain documents; they were made in the context of fiction with abstract visuals. His body of work “When it Rained, Winds Carried it to Places Unimaginable” which was a series of five paintings; consisted of visuals layered with different consistencies of paint. 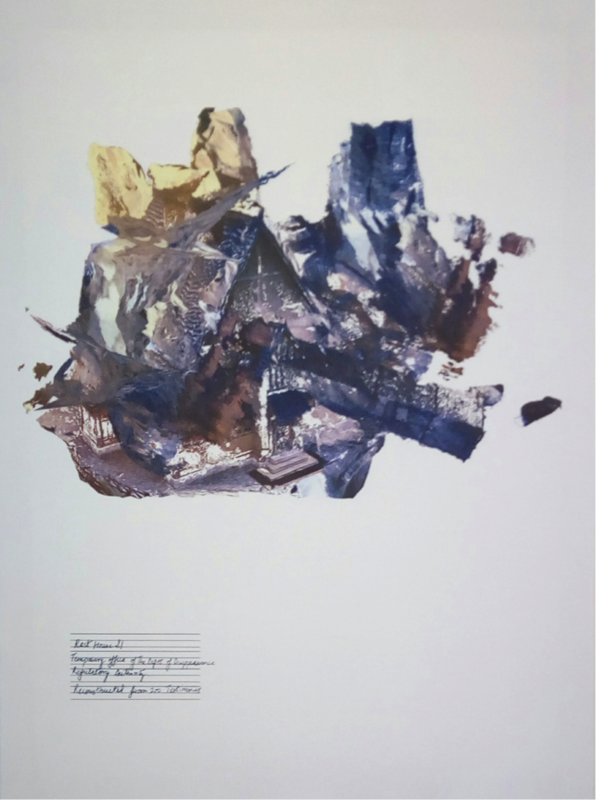 One of the pieces for example, consisted of thick strokes of blue and brown paint; beneath which was a house which was almost fading into the strokes. At the bottom was a scribbled text painted onto the canvas, which was a brief, yet detailed description of the artwork describing it as an office for the department of disappearances. It was being depicted as if the building was under surveillance; with the text almost looking like a part of a police report. 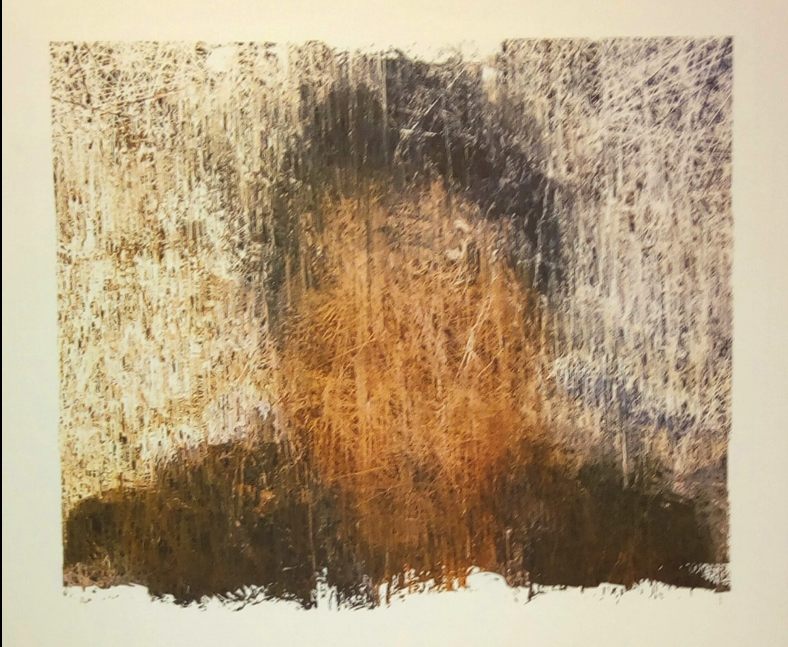 Another art piece of the same series made by Shah was depicting a painted yet scratched mug shot of a man which was describing him as a government post man, which could be symbolic of security checks that are being kept on common people and migrants. The second artist Mahbub Jokhio’s work comprised of video, charcoal drawings and an installation depicting the educational policies in Pakistan. 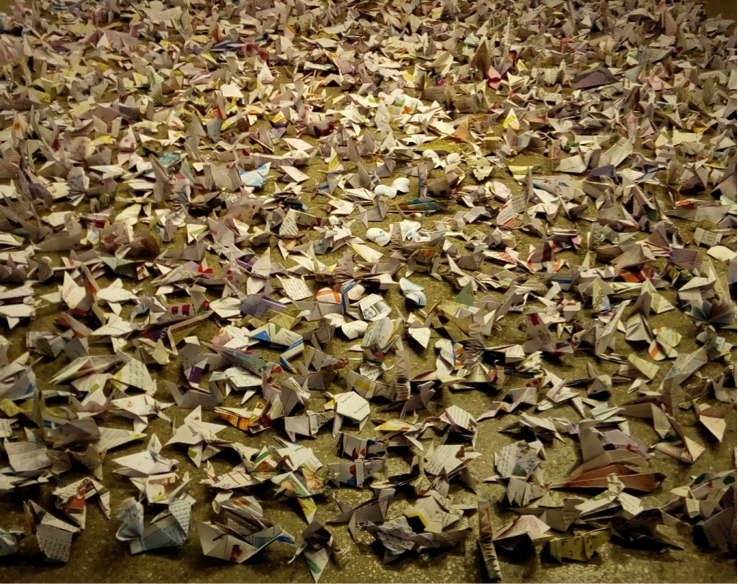 In his installation titled “Jungle”, which consisted of origami objects shaped into animals was made out of pages torn from Pakistani text and note books. This body of work was discussing the educational system in Pakistan in which children are forced to undergo the rote learning system which leaves no room for creative and meaningful thinking. 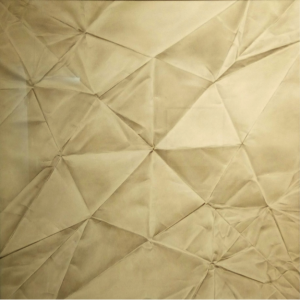 Similarly, Jokhio had also done charcoal drawings titled “Kashti”, “Macchli” etc which were drawings of unfolded origami objects. The use of charcoal to depict these drawings could be symbolic of the dull and colorless lives of the children who are made to go through repetitive and animal-like learning. The artists had done many more works but to talk about a few and their idea, through the use of their skills and medium, the artists not were not only addressing the two most important social issues that is education and surveillance but how these two are hovering over the future of people, children and migrants. These works are also symbolizing the patriarchal rule not only in Pakistan, but under which every other country is currently running. The social system which constitutes a forced education system is undermining the cognitive learning of children and also surveillance and inspection are taking away the freedom of people, keeping them under constant terror.